This project is easy and fast. Just dip plastic spoons into melted chocolate to make these tasty treats, then wrap them up with ribbon and cellophane. Use these fancy spoons to add a special touch to a dinner party, make a unique hostess gift, or brighten someone's day! 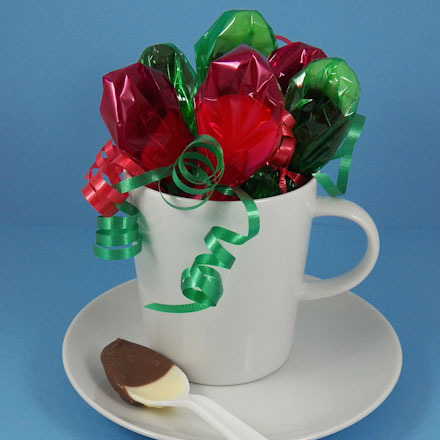 Make special chocolate spoons for Valentine's Day with red cellophane or red ribbon. Make mocha coffee in a flash by using a chocolate spoon to stir hot milk into your coffee! The kids will enjoy using the spoons in milk or as a special treat for Santa on Christmas Eve! This project requires few materials and is great for family, classroom or group craft time. No advance preparation is needed, other than gathering materials. In the microwave oven, melt white chocolate in a cup or small bowl. Melt milk chocolate in another cup or bowl. Follow the package's instructions for melting the chocolate. Of course, you may melt chocolate on the stove top in a small pan. Tip: The melted chocolate needs to be about 2" deep, so that it covers the submerged spoon's bowl. Caution: Melting chocolate requires adult supervision! Dip half of the spoons in white chocolate, and dip the other half in milk chocolate. Dip each spoon as far as the base of the spoon's bowl. Place the spoons on waxed paper, and let the chocolate set completely. Tip: For faster setting, place the wax paper and spoons on a tray and place it in the refrigerator or freezer for a few minutes. 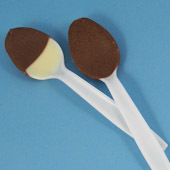 When chocolate has set, dip the white spoons in milk chocolate and dip milk chocolate spoons in white. This time dip only half way up the bowl of the spoon to create a layered effect. Place back on waxed paper to begin setting. Tip: Use any leftover chocolate on a bowl of ice cream! Let the chocolate set only partially (about 5 minutes), then gently dip the top half of the spoons in chocolate sprinkles or colored sugar. 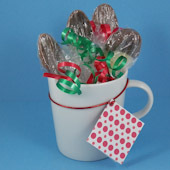 After the chocolate has set completely, wrap the spoon in cellophane and tie with ribbon. You might add a little tag, like "Stir me into your coffee". Use cellophane and ribbon in colors to match the holiday, occasion or gift. Tip: 7" squares of cellophane work well. You can use a double thickness of plastic wrap in place of cellophane. That's it! Your chocolate spoons are done! Thanks to Carlie for sharing this craft idea with Aunt Annie's Craft Exchange in 1996. Carlie shared, "This is not a new craft, but I still use it often. I gave the spoons, along with a pretty holiday mug, as gifts to my adult Sunday school class. I've also used them as shower favors and as an after-dinner special touch with coffee. I enjoy making and sharing all kinds of crafts with my grandchildren, family and friends." 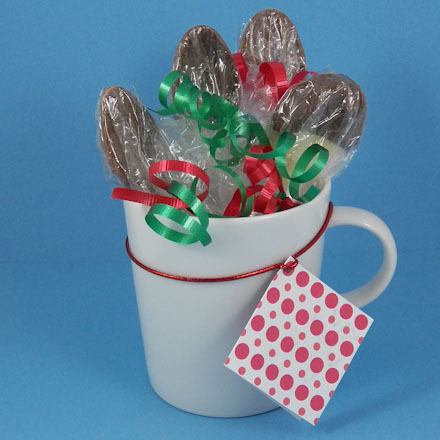 Tip: Chocolate spoons in a mug with a pretty tag make a great gift for a teacher! 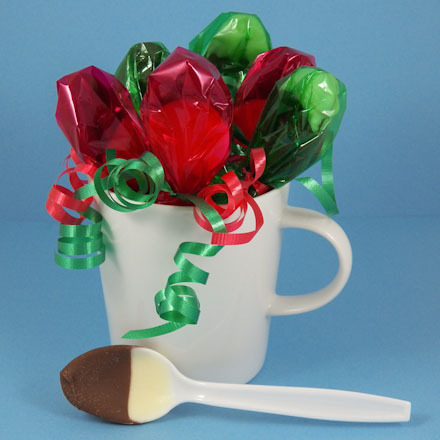 Tip: For a Christmas gift, wrap the spoons in red and green cellophane and ribbon.